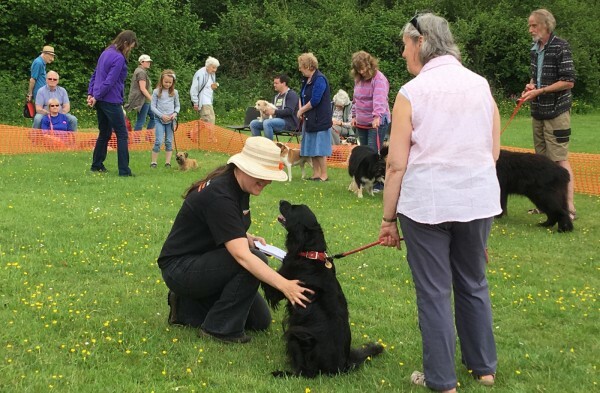 This photo someone sent me makes me laugh, because Henry and I (I am in hat) are clearly so delighted to be meeting one another, and Henry's owner is just full of 'oh god, my dog is doing it again, I'll just stand here and wait'. Henry was entirely adorable. He was 9, I think, and had that just grey muzzle starting. What a nice picture! He looks adorable--so happy and friendly. He was a star of a dog. The kind of dog that even non-dog-people like! I love Henry--his attitude does radiate delight! My poor foof would be So! Happy! if he could do that with people. I think sometimes that as wonderful as he has been to me, it is a little sad that he is a service dog because he is one of the most people-oriented dogs I've ever met. He manages to get in trouble at almost any big gathering of people because he'll sniff or nose (once even lick!) someone, which is Not Allowed. Having said that, if he was a pet he would need people who don't go out much. He is desperately upset about being left behind. When an ER denied me access with him, and I was too sick to manage to go somewhere else, my fiance took him home and then came back to stay with me, and it took over a week for Hudson to forgive me for the horror of being at home by himself for about 3 hours. He was rather begrudgingly obeying any commands I gave, but other than that he literally wouldn't even look at me most of the time. Brythen is like that with people too. He adores them! But I think many dogs dislike their people having to go off and leave them for any length of time. It's deeper than that with a service dog; they spend literally every moment with their partner, and they are responsible for doing things for that handler. So when you're separated from them, they worry about you and they worry about whether you're coming back. It's not uncommon for there to be major separation anxiety issues in recently retired (or soon to be retired) service dogs who are adjusting to spending time without their partners. I think we may try to dog-proof the house a bit before Hudson retires so that I can leave our other dog out of her crate so he has someone to be with. The one time he got left alone at home, we didn't have Bailey yet. Hopefully, her presence will help him. One of my co-workers at my previous employer has service dogs, and his last one was a golden retriever. I am mixed on whether goldens should be service dogs, because they want SO MUCH to interact with EVERYONE and get ALL THE WUBS. He was very good at picking things up and bringing them to his partner, which is exactly what his job was, but you could tell he did not think he was getting NEARLY ENOUGH WUBS. Hudson has adjusted to it, but he is still positively gleeful when I tell him he can go visiting. When I give him that command, he can go visit anyone, but his favorite person by far for that is my fiance. He's not as attached or comfortable with my fiance, but he does love him quite a bit. My poor pooch is so attached at the hip to me that he doesn't like it when I leave him with even my fiance. I think he worries a lot about whether someone is taking care of me when he's not there to do it. I understand seizure, diabetes, and heart alert dogs are even worse about that than mobility dogs, so I am glad that I do not have one as of yet! When Hudson retires, having a dog who can do heart alerts in addition to mobility work will be on the list of priorities, but very far down the list. The thing I need most is a dog who is intelligent and attentive enough to match my pace, which varies wildly depending on how I'm doing. Oh, and I need the dog to be gentle with me, as I have 2 different conditions that affect my joints, so I injure ridiculously easily. But the pace thing is the harder part, I think. On a bad day, I slowly hobble; on a normal day, I walk a little slower than average; on a good day, I walk quite quickly. Most dogs really only have one pace and if yours varies you're always asking the dog to speed up or slow down. I've been lucky with Hudson, he's unusually adaptable on that point. At a costuming seminar a few years ago I met a lady with a seizure dog who would get frantic if there was no line of sight in between her and her partner. Yeah, that's common with them. They really feel a need to keep their partner safe, and they can't unless they're close enough to pick up the signs. When Hudson and I had been partnered for I think about 2 years, I had to go to the ER and they refused to let him in (which is totally illegal). I was in bad enough shape that we couldn't just pack me up and go to the other side of the city. My fiance held on to Hudson and went outside the ER waiting room, but the security guard followed him and kept harassing him. My fiance finally took Hudson home, and came back to the ER. Hudson was home alone about 3 hours. He was SO MAD about it. He wouldn't have anything to do with me for the next 2 weeks. He'd obey commands if I gave them, but otherwise he didn't even want to look at me, much less be near me or receive affection from me. It was very upsetting (as if the ER denying me access to my dog wasn't bad enough). Oh, Henry! What a star! I hope he got a rosette. EVERYONE got a rosette. I think Henry got two. He so is. Probably the most charismatic dog at the show!